August | 2017 | Azazel's Bitz Box. 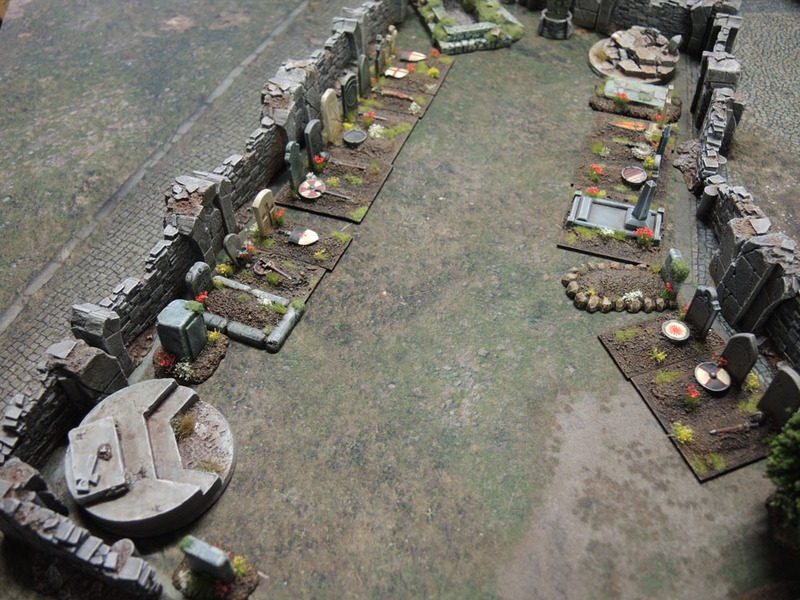 Making a Cemetary – Part 1: Renedra and Grendel Graves. 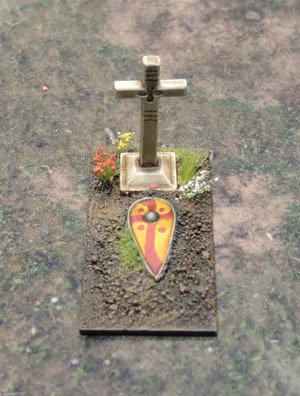 Today we have the first proper post on a little scenery project I’ve been planning and slowly working on for some time – a trope-laden fantasy cemetery. Or graveyard for those who prefer that term. 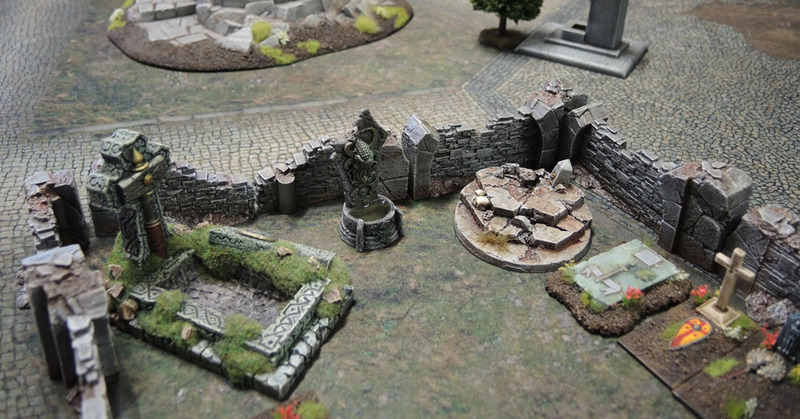 Over a year ago, I wrote up a small scenery post around some Uruk-hai ladders and an old metal grave that I’d finally done something with and actually finished. Sometime following that, I also found a literal bundle of additional Uruk-Hai ladders, Anyhow, in the comments, I mused about making some more, since it felt like creating more would be incredibly easy, and so inspired by Alex, IRO and especially D&B, I put together a pair of additional “grave bases”, using some Renedra Gravestones as the base. 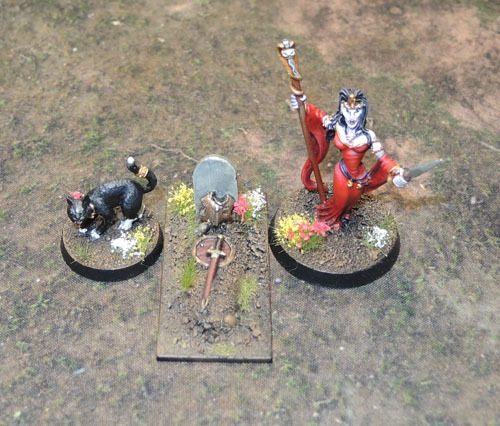 That original metal-cast grave that inspired the creation and form of these graves, flanked by Neferata and Bastet. 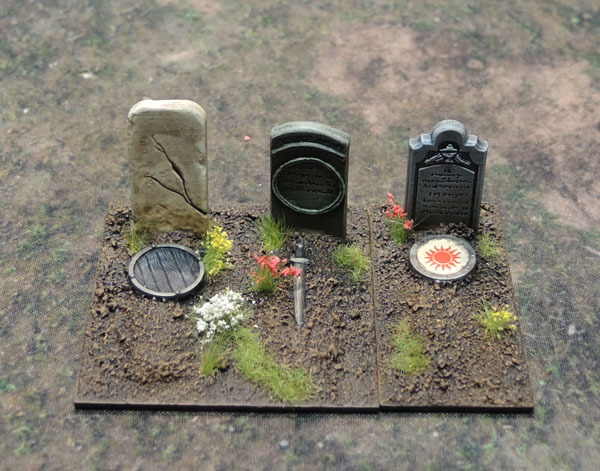 Of course, the wider graveyard project that these will be part of only exists because of the inspiration provided by Cheetor’s St Cranium’s Cemetary. 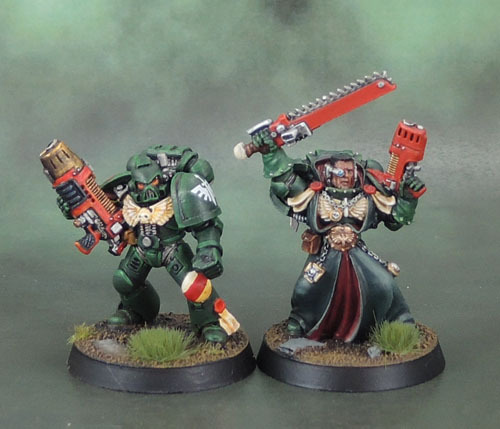 If not for that post and it’s followup batreps, I’d simply have had the various Grendel resin bits that I’d picked up in the 1990’s and they’d provide some scatter terrain, or be clustered together and that would be that. 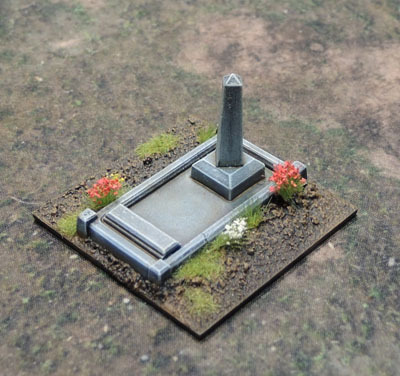 A slightly more fancy grave. This little experiment worked well. I used PVA initially to glue down the sand, and then a sample of a liquid adhesive created by Kibo called “Area 52” in order to firmly set the sand. I’ve been using it on a lot of my scenic bases lately, and I find it works really nicely when you want to build up impressions using sand while still giving a lot of control. The initial plan was just to create two, but since it was simple and easy enough I decided to put together an additional ten, with a mix of single and double graves, as well as one double-wide. I’ve kept on with the “dark brown earth” theme that I’ve been using for most of my models since the late 80’s. 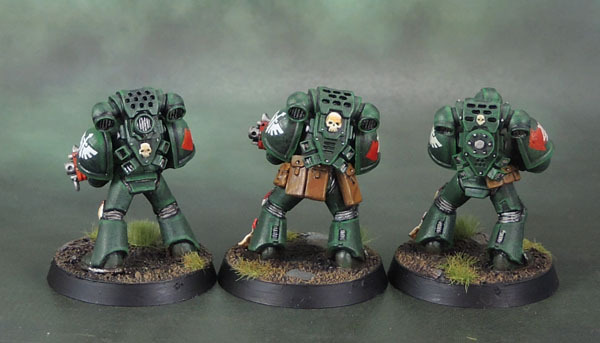 I originally started with the dark brown because I wanted to figure out a type of base that worked both for normal games of 40k as well as Space Hulk, as the green-based terminators I used back then looked too conspicuous on the SH tiles. I figured that dark brown was kind of non-specific and generic enough to work for scorched earth or muddy ground while being unobtrusive and dark enough to work for Space Hulk. I made a conscious effort with the painted colours on the first two bases to allow them to work reasonably well as generic scenery and also fit in specifically with the Undead Army. I also chose to decorate these bases with both rich green grass and red flowers for the same reasons as well as a wry wink to the soil being rich for growth. The flowers were placed again to be able to be read as placed or wild growth. I tried to come up with (sort-of) broad themes for them as well. 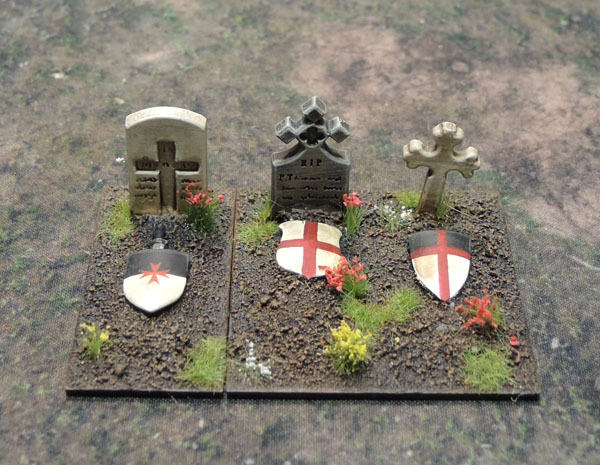 Several of the headstones that feature Christian crosses were decorated with shields painted with Templar symbols (except for the Maltese cross – that bit’s a transfer!) Others are Viking themed, Norman themes and a couple are more explicitly fantasy themed. 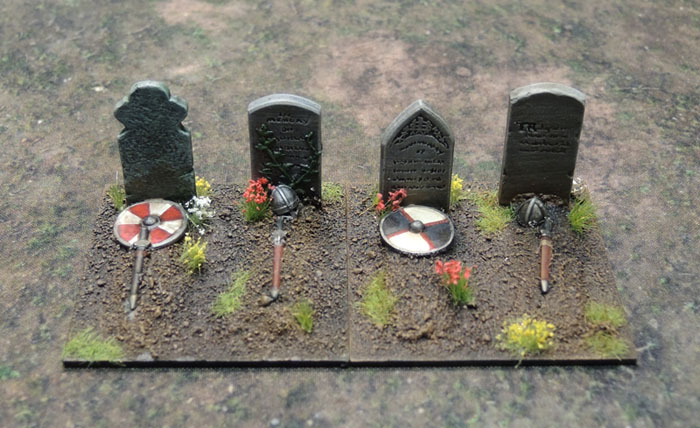 I figure while I’m sure they’re very much wrong in terms of actual historically accurate viking or templar graves, they would hopefully still look reasonable enough to use in games of Saga/Crescent and Cross/etc if need be. And of course, in fantasy games – anything goes! Gravestones by Grendel. Painted many moons ago. 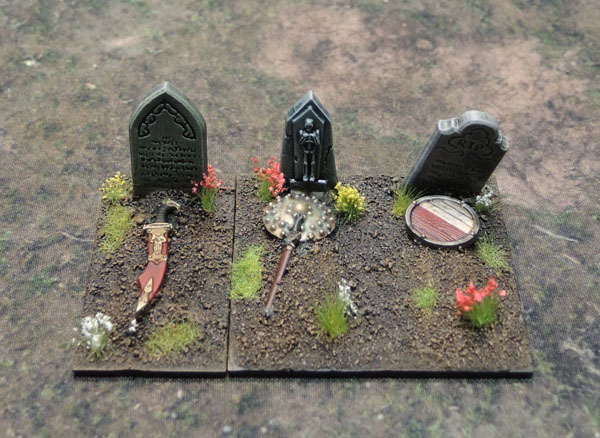 Reaper Bones Bat Swarms (with their gravestones). 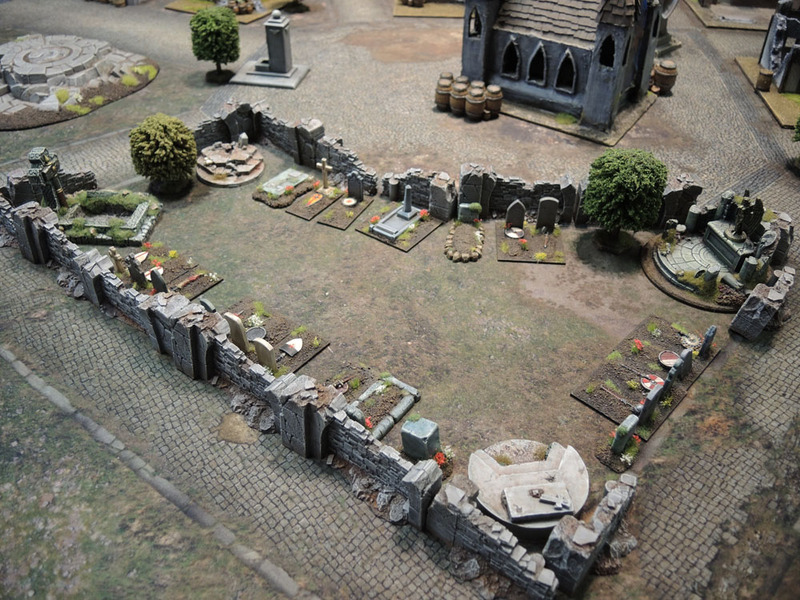 The Cemetery, as laid out for a not-so-recent game. 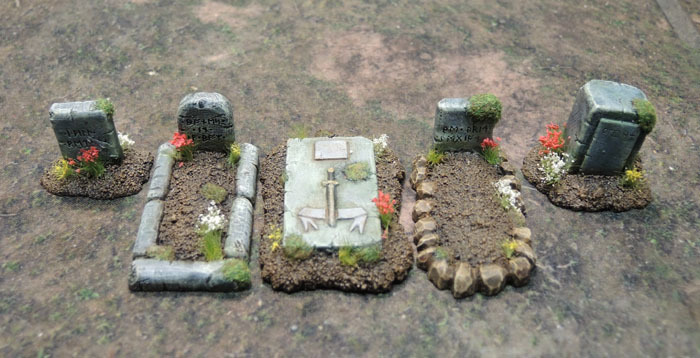 I’ve still got plenty more tombstones to work with, and have a Hirst Arts set or two on “the list” of things to buy. The two Garden of Morr sets I’ve got might finally get built this summer, depending on what else I still need to finish and get out of the way, along with the two Bones III Graveyard Expansion sets I got from Reaper. The graveyard is a fun little project, but definitely a slow burn. WAAAAGH! 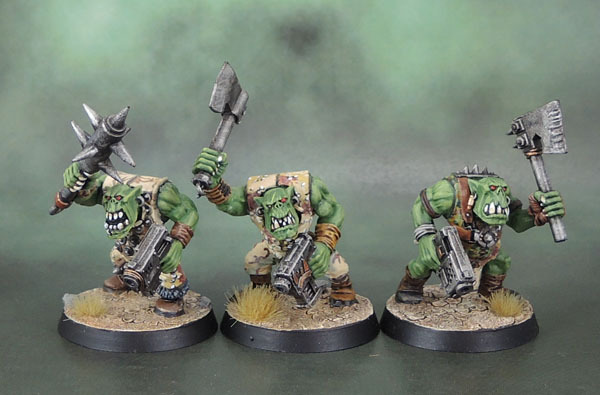 40k Ork Slugga Boyz. I actually started these models back in 2005, using a mixture of Fantasy and 40k Brian Nelson Ork components. I was originally making up one of those “Combat Patrol” forces (which is also how the DA and IW started life), though the entire Ork project was derailed hard due to a family tragedy which really hit me very hard. I’ve been eyeing the Orks I’d started back then a bit in recent months to get out and finish, and now I’ve started on them again. It’s been one of the reasons I’ve been getting back into painting the odd fantasy Orc and Goblin this year. Kind of “warming up” my greenskin painting skills. This army is going to be a tribute of sorts, so I want to do it justice. The CP force originally had 2 mobs of 10 (or 12ish?) Boyz. One mob of sluggas and one of shootas, with ‘heavy shootas and rokkits as the support weapons, along with metal Nobz, led by a Warboss and with some grotz and a slaver on the side. While they were all (mostly) built, none were actually completed in terms of paint, so I’m getting onto that now – along with making some additions. 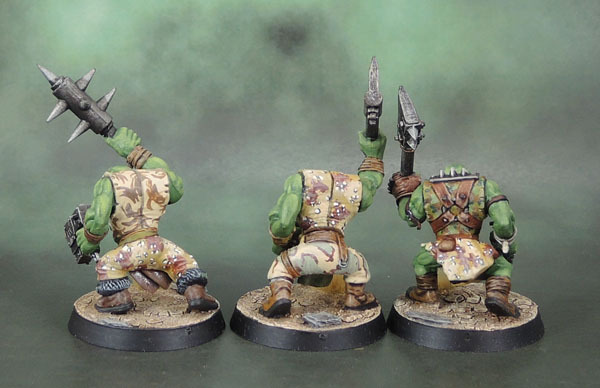 I don’t want to get carried away though – if I’m working on too many forces, none will get done to any satisfaction, so the Greenskins will be a nice side, palette-cleanser project for the time being, and I can take a serious look at them when their codex comes out. 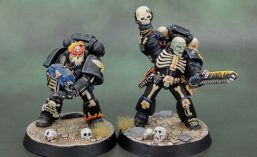 If I can get them to around PL30+ or so while painting them in this way, then so much the better and they can hit the table before the book comes out. I went with camo (or “kamo”) for their scheme because I enjoy painting it. It’s a lot more work than painting them in more basic browns and greys and blues and reds or whatever, but this way painting them manages to keep me interested. I won’t be doing too much with heavily green-based camo, since their skin is green and I don’t want them to blend into one another. Also, being Orks, I can vary the patterns and colouration as much as I like, since uniform isn’t exactly a strong concept to them. 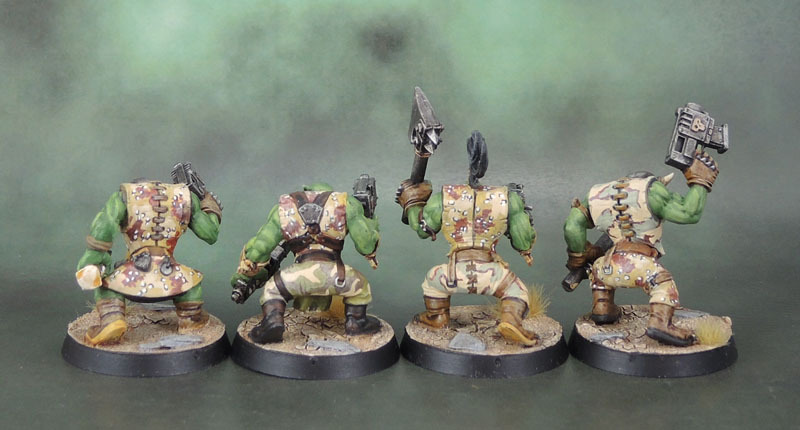 While I guess painting them in camo makes them nominally Blood Axes when it comes to having to choose a Clan for rules purposes, I have to admit I never liked the Ork Clans or many of the background changes when it was introduced during late-RT and early 2e. The whole “fungus men” thing has never sat with me, so I simply ignore that aspect in my own head-canon. (Similar to how I ignore “Mon’Keigh – and may Gav Thorpe forever burn in hell for that one!) 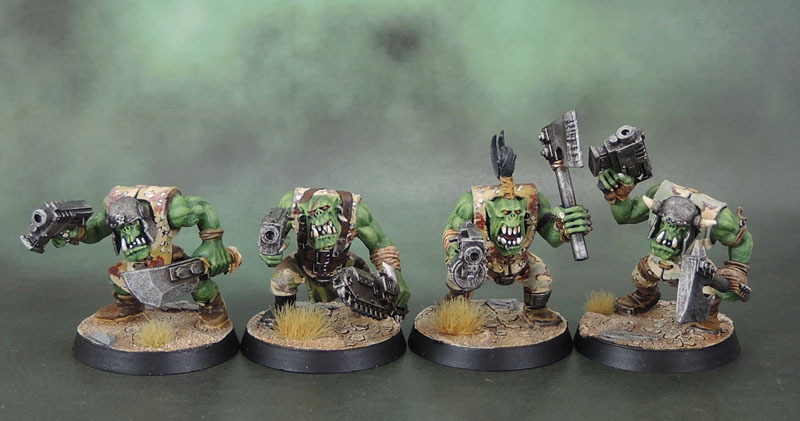 Some of the Clans were conceptually okay (Snakebites – the semi-feral Orks, for example) but too many of the examples and paint schemes went way too far down a ridiculous and garish road, reducing Orks to a silly sideshow of the comedy joke army of the 40k universe. 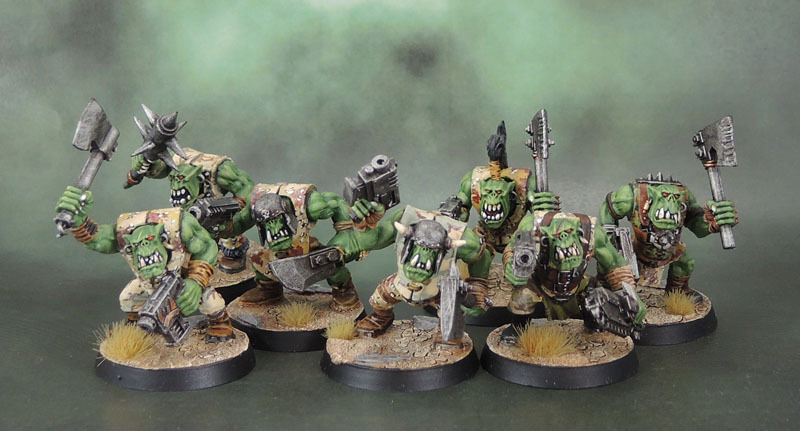 I can handle a few jokey things, like squigs and the way gretchin are portrayed (and the Goff Rokk Band), but generally speaking, I like my Orks guttural, angry and brutal, and want to reflect that with my force. Much more original RT-Rulebook (and ironically, 3rd ed Rulebook) than ‘Ere We Go. I’m glad to have these guys back on the painting desk after so long. 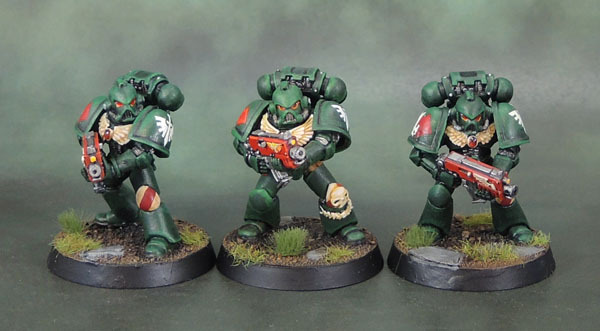 Taking a brief diversion from Dark Angels (still need to finish their Tac Sergeant – hopefully later today!) 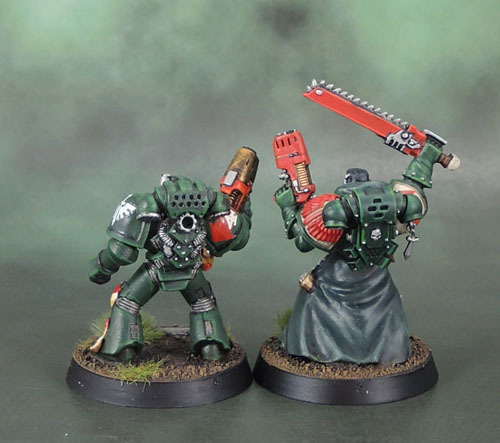 – but instead I have the Bolter half of a Devastator Squad for the Minotaurs. Once again, with luck I’ll finish the heavy half of the squad later today, but with poor weather for spraying in general, work tomorrow and so forth, it’ll likely be a few days at best until I can get them photographed and posted up. As with a lot of my Minotaurs, I’ve added in a few third party components here, which today are all from Anvil Industry, who are one of my favourite suppliers of unofficial bitz. 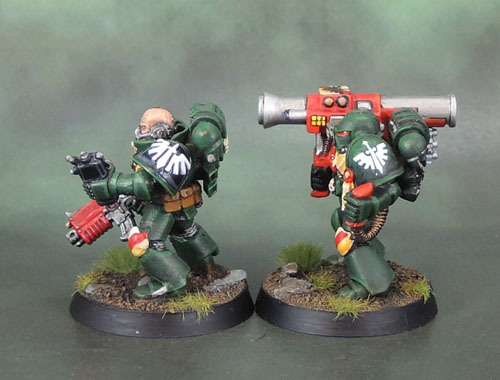 Two of the marines have scopes added to their bolters while once again I’ve sprinkled in a couple of Anvil’s “Spartan” helmets. The tabard is also from Anvil, though they’re currently OOP for some reason. The other additional parts are of course Forge World’s Minotaurs shoulder pads that look pretty impressive as always. My only gripe with them is that some of them seem completely inappropriate for the left shoulder pad. I did finally come up with a solution for that, which I’ll post up a bit later on. 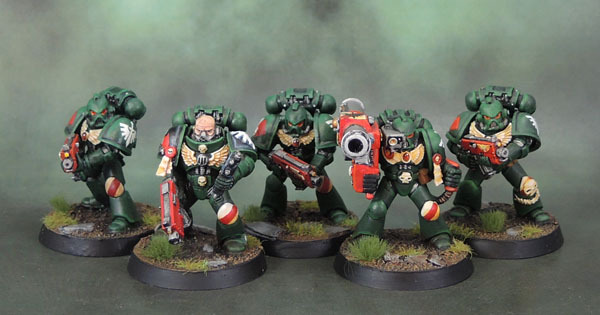 Anyway, I hope you enjoyed this short update, and hopefully I’ll have more from both the Dark Angels and the Minotaurs ready to show and ready to go very soon! 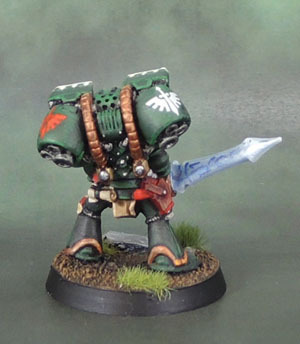 Dark Angels Librarian Gadreel, 2nd Octavius Crusade Company. Today’s model is another Dark Angel. One that is – once again – a long, long time in the making. 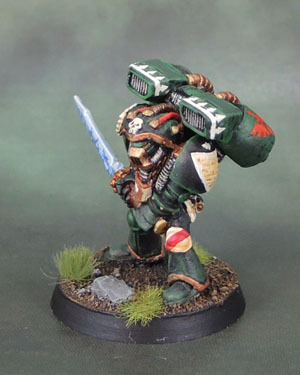 The model itself is one of the original Space Marine Librarians from 1990-1 – right around the time of the “Death Eagle Marine” variants, and like those figures, sculpted by Mark Copplestone. This particular fellow is imaginatively titled “Librarian with 2-handed Force Sword”. 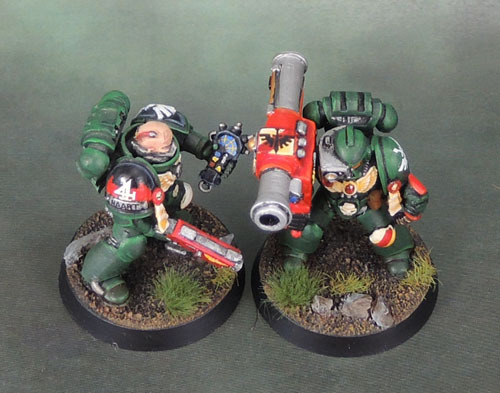 As you can see, he’s had a late-Rogue-Trader-era/2e Metal Jump Pack strapped (pinned!) to his back, allowing him to get stuck right into his foes. 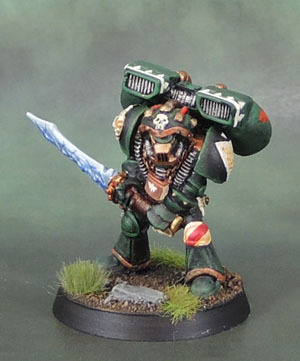 Again mirroring the Death Eagle Marines, his helmet is a proto-MKVII helm underneath the psychic hood. The trim comes from an old Epic transfer sheet, though he took a shelf dive at some stage and so one corner had to be repaired with paint. In the original small, DA force that I built in the past his job was (obviously) to join the Assault Squad and give them a more hefty punch in close combat. 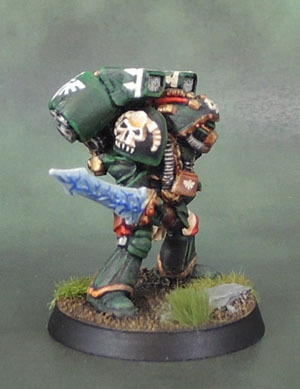 The transfers on his jump pack symbolise his twin allegiances to both the Dark Angels Chapter as well as the Inner Circle/Deathwing. After sitting about 3/4 complete for a good decade or so, he’s now finally complete and likely to purge the Emperor’s enemies while hunting the Fallen. I mentioned earlier the plan of running him alongside the Assault Squad, so I snapped a shot of them together. They’ll be coming to the table soon! 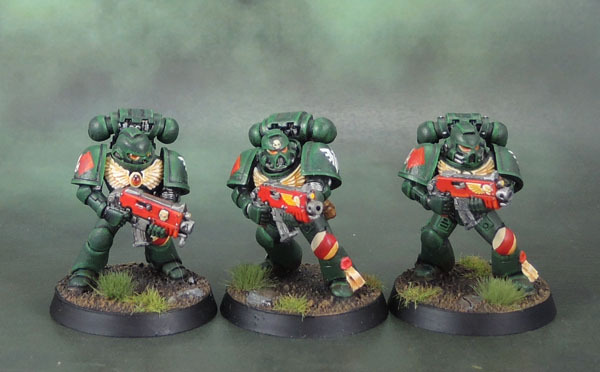 Dark Angels: 2 Section, 4th Squad (Tactical), 2nd Octavius Crusade Company. 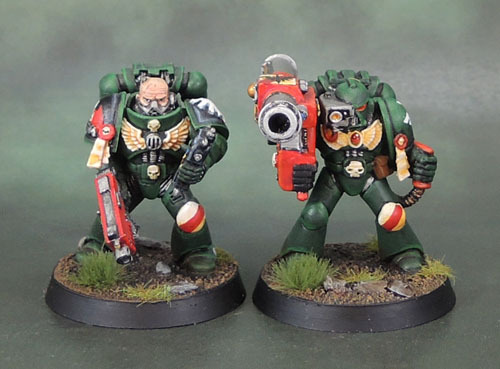 Recently over a couple of posts I shared the 3rd Squad (Tactical) of what I am calling the 2nd Octavius Crusade Company – which is my Dark Angels army that I am rebuilding for the latest edition of Warhammer 40k. 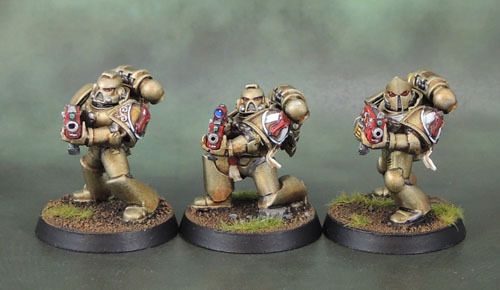 Today I’m sharing 2 Section of the 4th Squad (Tactical). The (Veteran) Sergeant of 1 Section is still a WIP on my desk – once completed, I’ll also post up 1 Section and the whole-squad pic. The Corporal of this squad was originally a regular Sergeant. Back at the time I first started building these models, one would pay extra for a Veteran Sergeant who had an extra attack and was able to take additional wargear. 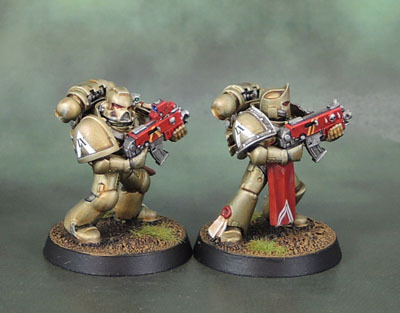 In the current rules, Marine Squads just come with what would once have been called a Vet Sgt as standard, so I’m re-designating my non-Vet Sgt to a Corporal who will act as a section leader, and have also built a pair of Corporals for 3rd (already seen) and 7th (coming soon) Squads. When built, I gave him an Auspex scanner, which was purely decorative for awhile, then had rules, and now is back to being decorative. Shrug. I did bother to give it some detail, though. 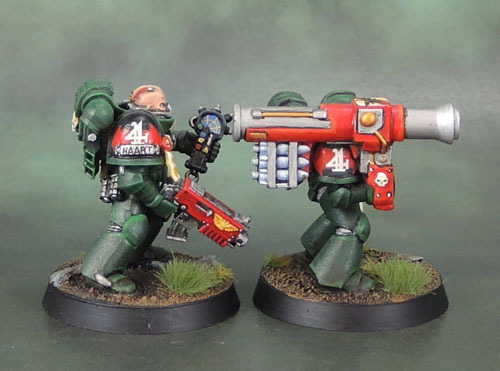 The heavy weapon of 2 Section is a Missile Launcher, once again it comes from the 1993 Warhammer 40k 2nd Edition starter box set. The other troopers in this section are all 2nd Edition Marines armed with 3rd edition Bolters and 3rd edition …arms. Two of the three were painted in my recent push to get this squad up to 10 men.